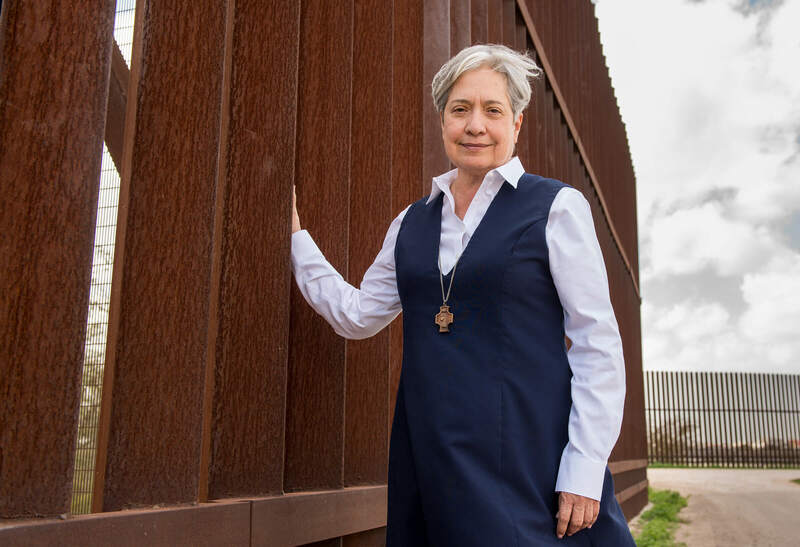 Photo Credit: CNS/Barbara Johnston, courtesy University of Notre Dame - Sister Norma Pimentel, a member of the Missionaries of Jesus, is pictured along a border wall between Texas and Mexico in late February 2018. Sister Pimentel, executive director of Catholic Charities of the Rio Grande Valley, has received national honors for her work with immigrants, but in remarks Feb. 2 in Washington, D.C., she told people at the Catholic Social Ministry Gathering she doesn't do anything different than what they do. Although her work along the Texas-Mexico border has brought her fame and celebrity, Sister Norma Pimentel, a member of the Missionaries of Jesus, who is executive director of Catholic Charities of the Rio Grande Valley, shrugged that off as best she could Feb. 2 in Washington. And as the immigrants keep coming, so do the volunteers: people from town and the surrounding area, retired sisters who stay for two weeks and a phalanx more.